The British know a thing or two about military tragedy. The death of Nelson, the Charge of the Light Brigade, Dunkirk – we honour our fallen heroes, acts of reckless bravery and valiant retreats. But celebrating victories? Is that the British thing to do? This month, on 18 June, the country will commemorate the bicentenary of one of the greatest triumphs of all, the Battle of Waterloo. Museums the length and breadth of the United Kingdom are marking this event by staging exhibitions examining the battle, its aftermath and its two great adversaries, Napoleon and the Duke of Wellington. The Royal Academy’s contribution has been to unveil a newly conserved masterpiece of Victorian art: Daniel Maclise’s drawing The Meeting of Wellington and Blücher after the Battle of Waterloo. 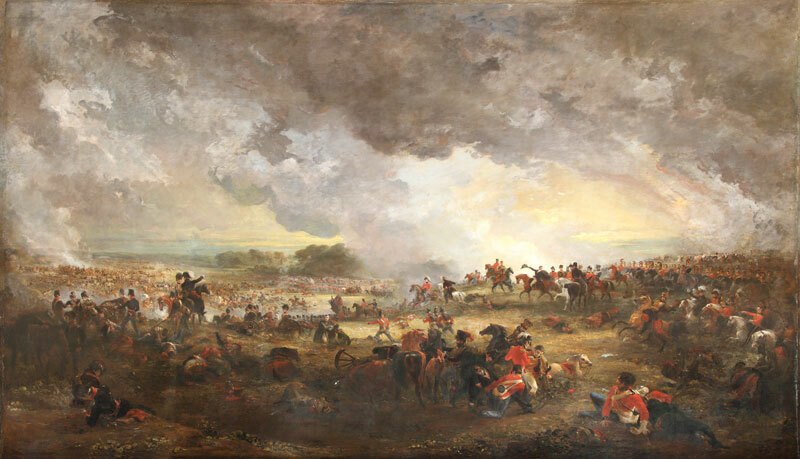 Currently being exhibited at ‘Waterloo 1815: The Art of Battle’ (until 23 August) at the Royal Armouries, Leeds, it returns to the Royal Academy in September where it will be displayed until January 2016. The drawing is epic in scale: more than 13 metres long and 3 metres high, and comprised of 10 separate panels, it took Maclise more than a year to complete in 1858–59. A tour de force of draughtsmanship, it combines consistent and meticulous descriptive detail with a crowded composition that is orchestrated around the dramatic encounter between the two generals. The work is a preparatory cartoon for a wall painting Maclise executed for the decorative scheme of the newly rebuilt Palace of Westminster; his two monumental frescoes there, The Meeting of Wellington and Blücher (1861–63) and its companion The Death of Nelson (1863–65) were conceived as part of a series of military paintings in the Royal Gallery, intended to rival the Galerie des Batailles at Versailles. Here the nation’s artists would show their skills at large-scale history painting, demonstrating that Britain could excel in art as well as in arms. When Maclise displayed his cartoon in situ in 1859, this ambition appeared to have been realised: The Art Journal acclaimed it as ‘the greatest work of its class that has been produced in England: nor is there any painter of the Continent who has surpassed it’. But for all its heroic proportions, this is not an image of military triumph. There is something understated about the rustic setting and the simple handshake between the two grim-faced generals. Their victory has been won at terrible cost, as we can see from the heaped bodies of the wounded and dead in the foreground. As in The Death of Nelson, victory is weighed against sacrifice. Maclise made the drawing more than 40 years after the event it depicts, by which time British attitudes to warfare had been fundamentally reshaped by the more recent Crimean War. But even in the immediate aftermath of the Battle of Waterloo, artists and writers struggled to find appropriate ways of describing an event of such magnitude and significance that it seemed to defy representation. British artists at the time lacked a domestic tradition of grand-manner battle painting within which to work, and there was widespread public distrust of militaristic art, which was associated with Napoleonic propaganda. Contemporaries recognised Waterloo as an epochal event, the conclusive defeat of Napoleon and the end to more than 20 years of warfare with France. The British public hungered for information about the battle, avidly consuming reports, images, exhibitions and other forms of entertainment celebrating the victory. Almost as soon as the last shot had been fired, tourists started to flock to see the spectacle of the battlefield. For the first visitors, it was quickly apparent that this had been a killing field, a place of unimaginable carnage. It has been estimated that between 42,000 and 53,000 men were killed or wounded, and around 15,000 horses, on that single day in June, all within an area of about five square miles. Within hours many corpses had been stripped of valuables, weapons and clothing, and even their teeth, by looters. The blood-soaked artefacts were later sold to tourists as memorabilia – which is the provenance of many of the Waterloo relics that will be exhibited in museums up and down the UK this year. The British Museum is currently displaying a series of newly discovered watercolour sketches made by an amateur artist within days of the battle, which depict the deserted Belgian countryside with the naked bodies of dead soldiers clearly visible, strewn across the ground (as part of ‘Bonaparte and the British: Prints and Propaganda in the Age of Napoleon’; until 16 August). Even after the bodies had been buried in shallow graves and pits, tourists still had a palpable sense of the immense cemetery that lay beneath their feet. Walter Scott, Lord Byron and William Wordsworth all travelled to see the famous field of Waterloo, each penning verses not so much in celebration of the victory as in response to the ground upon which it had been won. Wordsworth, who in 1816 had claimed a ‘vision clear…to comprehend this victory sublime’, revised his opinion on visiting the battlefield in 1820 and wrote of ‘such vast hoards of hidden carnage near, / And horror breathing from the silent ground’. Turner finds no glorious victory at Waterloo, only death and despair, which he describes in terms of the sublime through the dramatic handling of light and shade. 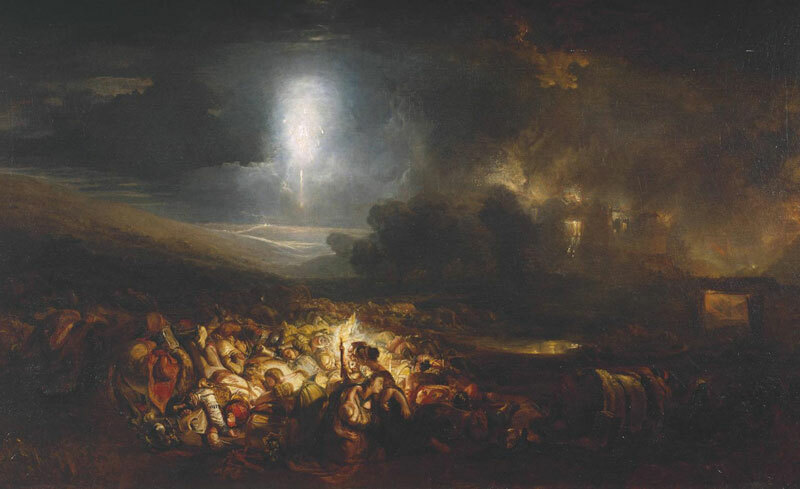 It is the night after the battle and a group of women and children search in the darkness for their fallen menfolk, the glow of their torch illuminating heaps of bodies and broken equipment. Behind them the farm of Hougoumont, scene of some of the day’s heaviest fighting, continues to burn, black smoke billowing into the night sky. And in the far distance, a white flare sent up to discourage looters casts an eerie light on the carpet of corpses stretching to the horizon. With its focus on the aftermath of battle and feminine grief, Turner’s painting rejects any notion of martial heroism; it would have conformed to anti-militaristic attitudes that were widely held at the time. For the British ruling classes the victory over Napoleon was a vindication of traditional social and political values over the egalitarian and meritocratic ideals of the French Revolution and the self-made emperor. Reactionary attitudes were felt in the cultural sphere too, through a reassertion of elite taste and the established hierarchies of art. In 1816, the British Institution, an organisation run by aristocratic connoisseurs and collectors, resolved to reinvigorate British history painting by launching a competition with a 1,000 guinea prize for large-scale pictures ‘illustrative of our recent successes’ at Waterloo and earlier in the Napoleonic Wars. The competition cannot be counted a success. Of the 15 entrants, few were established artists, largely because the Royal Academy snubbed the project out of a sense of rivalry with the British Institution. Sections of the press also turned against the competition, having little enthusiasm for what they saw as an aristocratic celebration of militarism. Nevertheless, the British Institution directors awarded first prize to James Ward, the only Royal Academician to enter, for his The Battle of Waterloo in an Allegory. The sketch Ward submitted is now at the Royal Chelsea Hospital, but the finished canvas has not survived. It took another four years to paint, a process that nearly ruined him financially, and at 10.7 by 6.4 metres was so vast there were few venues capable of displaying it. Instead of inspiring excellence in British art, the momentous events of 1815 seemed to encourage certain artists to feats of heroic excess, more likely to end in personal disaster than critical triumph. Ward’s painting borrowed heavily from Rubens’s The Triumph of the Eucharist, and it was this Old Masterly pedigree, and the idea that allegory was an intellectual or poetic mode of art, that no doubt appealed to the directors. The critics, however, ridiculed these pretensions, the dubious foreignness of Ward’s style, as well as the picture’s conceit that Wellington, who was now a member of Lord Liverpool’s unpopular government, might stand ‘on the Car of War, supported by Britannia, and attended by the Seven Cardinal Virtues, commanding away the demons of Anarchy, Rebellion and Discord…’ – as Ward’s lengthy supporting notes put it. Perhaps cognisant of the controversial nature of its first choice, the British Institution also decided to award a second prize, which they gave to George Jones’s more straightforward depiction of the battle, which he completed in 1820. Jones had been a serving soldier under Wellington and his military experience gave a valuable stamp of authenticity to his paintings. His Battle of Waterloo claimed a high degree of documentary accuracy, but with its aerial viewpoint and sweeping vista was modelled more on topographical landscape than grand history painting. A huge canvas with masses of tiny figures, it also had affinities to the panorama, a popular form of visual entertainment at the time – and would have been considered to be at the other end of the hierarchy of artistic genres from the elevated creation that Ward had attempted. Jones’s lively scene may have appealed to certain tastes, but it was a very different treatment of Waterloo that captured the public imagination in 1822. And this was not a battle picture at all, but an image of London street life. When David Wilkie exhibited Chelsea Pensioners Receiving the London Gazette Extraordinary of Thursday, June 22nd 1815, Announcing the Battle of Waterloo!!! at the Royal Academy, crowds queued up to see it and a rail had to be placed in front to hold back the crush of people. Looking at this modestly sized, unassuming painting today, it is not immediately obvious what all the fuss was about. Chelsea Pensioners depicts a moment, four days after the battle, when Wellington’s report of victory is joyously received by a crowd gathered near the Royal Hospital for retired soldiers in Chelsea. As Wilkie explained in his catalogue entry, the assembly includes veterans not just from the Napoleonic campaigns, but also from earlier wars against France stretching back half a century, as well as Irish and Scottish soldiers, and representatives of the wider British empire. They share the news with a mixed group of civilians: male and female, old and young, rich and poor. It is an image of a diverse nation united through time, geographically and socially, by military service. 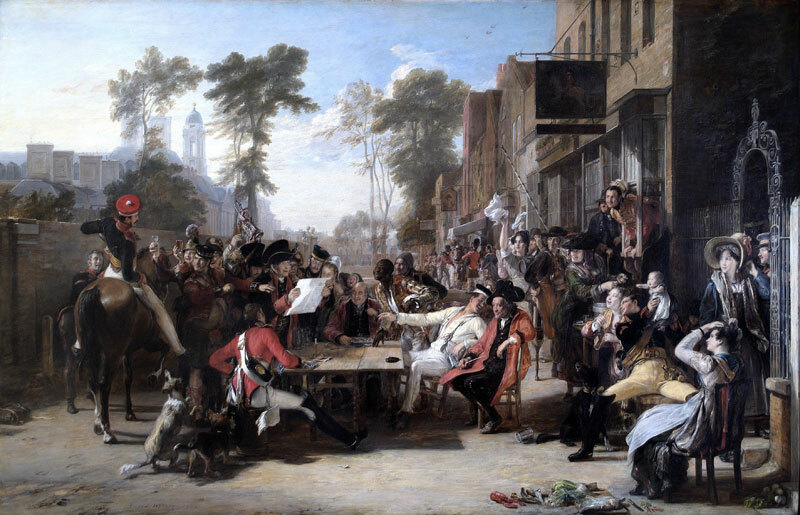 Wilkie’s painting aspired to elevate a scene of everyday life to the status of high art, but part of its appeal was in the way it encouraged viewers in the Royal Academy to project themselves into the patriotic community depicted in the painting, as they crowded around to get a better look. Britain in 1822, however, was by no means the united or contented nation imagined in Chelsea Pensioners. Immediately after Waterloo the country had entered a severe economic slump, described by Byron as a ‘malady of Peace’: wages fell, unemployment reached chronic levels, there was famine and widespread unrest. Few returning veterans enjoyed the benevolence of the Chelsea Hospital, and many came back to a life of destitution. But with their perceived potential for organised violence, they gave a dangerous edge to the growing movement for political reform. The people crowding around Chelsea Pensioners in 1822 had every reason to doubt this image of social harmony, but most were happy to be taken in by the fiction. Weariness was setting in. ‘London is sick to death of Waterloo,’ wrote one newspaper in 1824, ‘there have been so many daubs of this national “set-to” that people…would now almost as soon wish to be in such a battle itself, as to visit representations of it’. In the decades of peace that followed, the army was more likely to be deployed to suppress domestic dissent than fight foreign enemies – as it had been in Manchester at the infamous ‘Peterloo’ massacre of 1819. This was not an environment conducive to the celebration of military heroics. New opportunities for history painting, in this case state-sponsored, arose in the 1840s and 1850s with the proposals to redecorate the newly rebuilt Palace of Westminster. By now, however, heroism had been redefined in terms of religious or chivalric ideals, and most of the commissioned paintings looked back to a medieval or mythical sense of Britain’s past. Maclise’s frescoes in the Royal Gallery were exceptions, dealing with modern subjects in a robustly militaristic manner. The Meeting of Wellington and Blücher after the Battle of Waterloo will be the focus of ‘Waterloo, Wellington and Westminster’, a special exhibition at the Houses of Parliament this summer (3 August–24 September). The fresco is a severe image: it pays due deference to the authority of art, both to classicism, through its shallow pictorial field and frieze-like arrangement of overlapping warriors and steeds, and to Old Master precedents in the academic poses of the dead and dying. Yet Maclise’s scrupulous realism unflinchingly portrays the sufferings and bloody sacrifice of the rank-and-file. 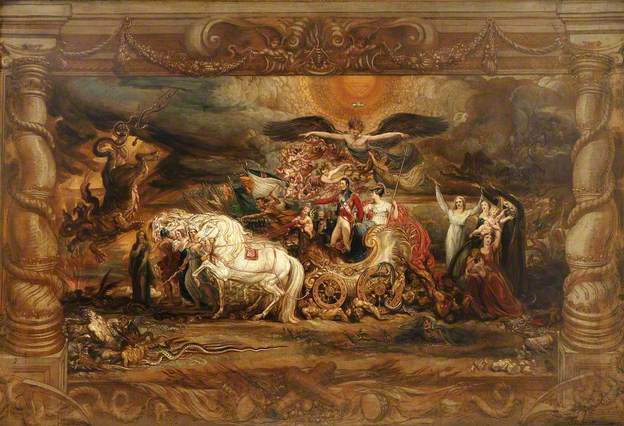 With Waterloo now fading from living memory, Maclise had met the challenges the earlier artists had contended with, reconciling the demands of an epic mode of art with recognition of the consequences of war. His painting neither rejects martial heroism as Turner’s had, nor seeks to implicate the audience in the celebration of victory, as Wilkie’s did. Maclise also presents a more democratic view of war by bringing Wellington and his officers among, and on a level with, the men they commanded. Within a couple of years of Maclise completing his frescoes in the Houses of Parliament the franchise had been extended to include a much larger proportion of the population, though it would be another 50 years before the descendants of all those who fought were entitled to vote. The Meeting of Wellington and Blücher looks forward rather than back, asserting that the sacrifice of the common soldier is a fitting subject for the highest forms of art and the grandest venues of state. Martin Oldham is an independent researcher and art historian based in London.